Now here’s a superhero that’s difficult to translate to the big screen . . .
Born of mythology and armed with a magical hammer, Thor isn’t exactly Batman or Iron Man, lacking the brooding and the gadgets required to keep viewers in a shadowy mood of fractured valor. 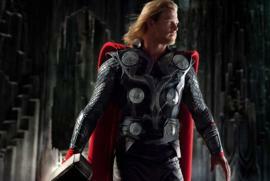 To successfully bring the character to cinemas, director Kenneth Branagh has conjured an epic visual experience, infusing Thor with the expansive sweep of a comic book and some snappy personality, creating a wildly entertaining yarn that effectively launches the adventures of a new caped crusader (and his trusty hammer). Odin (Anthony Hopkins) is the ruler of Asgard, a vast golden kingdom where magic reigns. After thwarting the universe-dominating efforts of the Frost Giants of Jotunheim, Odin keeps peace, educating his two sons, Loki (Tom Hiddleston) and Thor (Chris Hemsworth), on the finer points of leadership, hoping to prepare his boys for the throne. For Thor, the challenge to remain passive while the Frost Giants make a new play for the all-powerful Casket of Ancient Winters is too much, and for his arrogance and brash behavior, he’s exiled to Earth, where the former God of Thunder finds himself in the care of enthusiastic physicist, Jane Foster (Natalie Portman). Stripped of his powers, under the careful watch of S.H.I.E.L.D., and unable to wield his weapon, the hammer Mjolnir, Thor is left vulnerable, while Loki finds his path leading to darker forces, looking to disrupt the power of the Bifrost Bridge, a portal leading to other worlds, hoping to make Thor a permanent resident of Earth. At least for the poor souls who didn’t spend their childhood with their noses in comic books (heathens! ), Thor isn’t always an easy film to follow. Hitting the viewer with all sorts of locations, characters, and terms, the screenplay is perhaps one of the more ambitious pieces of writing the genre has seen to date, not due to rabid character complexity, but the sheer amount of exposition. After all, even the hammer has a name! There’s an entire world of Thor to establish in the picture, which merges Norse and Arthurian mythology and ink-and-paint hijinks, creating a mesmerizing sci-fi touch to standard hero mechanics. "Director Branagh and his production team have made something fulfilling out of difficult material . . ."
Thor is a god with extraordinary powers and incredible arrogance, which provides a meaty arc of rehabilitation for the hulking blonde, who looks to reclaim the war cry he lost during his fall from Asgard. The hero is a handful, well stoked by Branagh, who brings Shakespearean tenacity to the picture, exploring deceptions and setbacks with enthusiasm for broad strokes of confrontation, filling the picture’s lungs with outstanding fire and charisma, taking Thor and the Asgardian way seriously, while instilling the rest of the film with needed Earthbound humor, or at least expected human hesitancy. Splitting time between magical realms and Earth, Thor juggles the distance quite well, marrying some light comic relief with bellowed confrontations, with Loki feeling out his newfound sense of purpose, turning Asgard upside down, disrupting peace and the pure purpose of the Bifrost Bridge. Branagh cleanly communicates the incoming threat, deploying a series of swooping camera moves and Dutch angles to generate a proper funny book atmosphere, manufacturing a stirring tone for a feature that’s isn’t exactly action packed. Sure, Thor does involve himself in some early rumbling with his Asgardian brothers and sisters (including Ray Stevenson and Jaimie Alexander), making mush out of his enemies with the thunderous power of Mjolnir (gotta love those thudding iron sound effects), and there’s a whole encounter with Asgardian enforcer Destroyer, a fire-belching machine sent to Earth to test Thor’s newly acquired skills of negotiation. While keeping a healthy pace, Thor isn’t a thrill ride with stunt sequences planted every 10 minutes. Branagh is more consumed with selling the fantasy than the fury, a development that creates a richer, more engaging picture. With renewed focus on the plot, Thor is brought to life by a winning cast, with Hemsworth proving himself in a major way as the title character. A brute of charm and intelligence, Thor is a tricky individual, requiring a special wink and a physical presence that’s able to convey the deflation and rebirth of a future king. Hemsworth nails the tonality of the role, triumphantly creating a brash and vulnerable Thor, while generating some butterflies with Portman, who gives her side of the googly eyes a welcome spin of tickled disbelief. The love story seems shoehorned in to warm up the proceedings, but there’s chemistry there to be explored. Also amusing is Stellan Skarsgard as Jane’s disapproving cohort, who dares to challenge Thor to a drinking contest. The Asgardians are equally merry and devious in their roles, though I must admit that Anthony Hopkins is superbly commanding as Odin, making a regal screen impression he hasn’t enjoyed in decades. While plot particulars weigh down the conclusion of the picture, Thor remains a heartily satisfying picture with an unexpected superhero plan of attack. The film offers a few surprises (as per routine with a Marvel movie, stay for the end credits), a good number of sight gags, and a full-bodied exploration of a fringe player in the comic book domain. I have to hand it to Branagh and his production team, they made something fulfilling out of difficult material, clarifying back story and establishing Thor as a hammer-throwing force of nature for (hopefully) a few more movies.